Here's a bullish thesis for the maker of packaged foods and coffee. J.M. Smucker Co. (NYSE:SJM) makes products that have filled American cupboards for generations, such as its iconic Smucker's jam, Folgers coffee, and Jif peanut butter. Smucker stock's total return (which includes dividends) of 14% over the one-year period through March 3 significantly outpaced the S&P 500's and chocolate giant Hershey's (NYSE:HSY) nearly 4% and 7% losses, respectively. It's about on par with snack-food maker Mondelez's (NASDAQ:MDLZ) 5% return, though less appetizing than fellow packaged-food producer ConAgra's (NYSE:CAG) 25% return. Smucker, however, is clearly the long-term winner of the group, with its 10-year return of 349% crushing the broader market's 90% return. In this article, I look at three reasons why Smucker's stock price could rise. This is not a declaration that any of these things will happen, nor that the stock price will increase. I'm just examining the merits of a bull argument thesis. The coffee segment accounted for about 29% of Smucker's total revenue in the most recently reported quarter, but an outsized 39.6% of segment profit. That's because its profit margin is considerably larger than the other segments. Moreover, the segment's profit margin expanded in the most recent quarter an impressive 4.3 percentage points from the year-ago period. This was in part due to the introduction of Dunkin' Brands' Dunkin' Donuts K-Cups, as K-Cups boast higher profit margins than traditional bagged ground coffee. Smucker began exclusively selling this product in grocery stores and other outlets late last May. Strong sales of Dunkin Donuts K-Cups could continue to help expand the coffee segment's year-over-year profit margin, thus helping to boost the company's overall profit margin, which could lead to a rise in the stock price. How likely is this scenario? It's quite likely, at least for Smucker's fiscal fourth quarter, which ends in April and, to a lesser extent, its first quarter of fiscal 2017, which ends in July. Smucker didn't sell Dunkin' Donuts K-Cups in its fourth quarter of fiscal 2015 and only sold them for for two months in its first quarter of fiscal 2016. Big Heart's brands. Image source: J.M. Smucker. Smucker made its largest acquisition ever when it bought Big Heart Pet Food Brands in March 2015 for about $5.8 billion. Big Heart is a main player in the $21 billion U.S. pet food business, making such staples as Milk-Bone, Kibbles 'n Bits, and Meow Mix. Big Heart contributed nearly 30% of Smucker's total revenue in its most recent quarter, almost all of which falls into the company's new U.S. pet foods segment. This segment experienced a sequential increase in segment profit margin from 15.6% in the second quarter to 17% in the third quarter, and Smucker expects another sequential step-up in the fourth quarter. Smucker has certain targets for Big Heart for such things as cost savings through synergies, revenue expansion, and gross margin expansion. Smucker expects to harvest about $200 million in annual cost savings within the first three years of the acquisition, according to The New York Times. Smucker CFO Mark Belgya said on the recent quarterly conference call that the company is on track to deliver its target of growing full-year segment gross margin by 100 basis points compared to the prior year. It's possible Smucker could realize more cost-saving synergies from the Big Heart acquisition and/or exceed its performance goals in the pet food segment in fiscal 2017 and beyond. It bodes well that, despite weakness in its mainstream dry dog food category, Smucker's higher-margin categories of pet snacks and premium pet food are performing well. Smucker has historically been successful at spotting attractive acquisition targets and incorporating them into its business. Its acquisition of Folgers from Procter & Gamble in 2008 has proven to be masterful, given that the coffee segment now accounts for about 40% of segment profit. The primary reason I included this chart is to show that Smucker's valuation based upon free cash flow -- a P/FCF of 13.6 -- appears considerably more attractive than its valuation based upon earnings -- with a P/E of 38.2. The price-earnings ratio is the most common valuation measure used, so investors who don't look beyond that to measures based on cash flows might decide the stock is overpriced. Some of those same investors would likely feel differently if they examined cash flow valuation metrics. 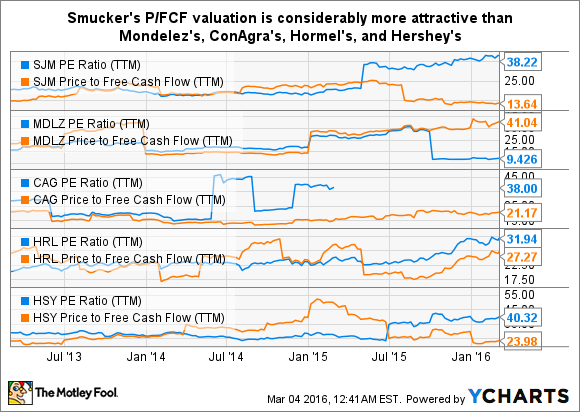 The reason Smucker's P/FCF is relatively quite low is because the company's FCF is powerful. Smucker's FCF got a big boost from the Big Heart acquisition a year ago, though it's been trending upward faster than earnings over the long-term, too. Operating and free cash flows provide a better picture of a company's business performance because they're the real McCoys when it comes to money. By contrast, operating income and net income -- "earnings" -- are merely accounting measures. From a P/E valuation standpoint, Smucker's stock is about on par with Hershey's, somewhat pricier than Hormel's, and much pricier than Mondelez's. (ConAgra doesn't currently have a P/E ratio because it has negative earnings.) However, from a P/FCF standpoint, Smucker's stock is by far the most reasonably valued. The point is that using different valuation metrics to make relative valuation judgments about stocks in the packaged food group yield different findings. Smucker stock could rise if Dunkin' Donuts K-Cups continue fueling the coffee segment's already strong results, if the Big Heart acquisition outperforms expectations, and/or if more investors recognize that Smucker's valuation based on free cash flow is compelling.